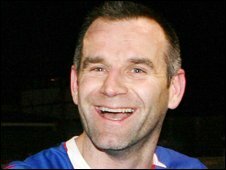 New Lisburn Distillery manager Jimmy Brown has won the race to sign former Linfield striker Glenn Ferguson. The player, who scored 285 goals in a glittering career with the Belfast Blues, has signed a one-year deal with the New Grosvenor club. Ferguson, who will be 40 in July, had wanted to play for one more season. "He's not just interested in a pay-day for the last throw of the dice - we have not won a trophy in 15 years and he sees it as a challenge," said Brown. He added: "He wants to win things and I want to win things. I think that was the deciding point and I'm really looking forward to working with him." Ferguson's arrival will soften the blow of young striker Curtis Allen's imminent departure from Lisburn Distillery. Ferguson joined Linfield from Glenavon in 1998 for a record £55,000 and won five Northern Ireland caps. He is the third all-time highest scorer in Irish League football, behind Jimmy Jones and Joe Bambrick. During his Linfield career, Ferguson won six league championship and four Irish Cup medals and was voted the Nl Football Writers' Association player of the year a record three times.